"Assessment of Nutrient Loading and Eutrophication in Barnegat Bay-Little Egg Harbor, New Jersey in Support of Nutrient Management Planning"
The New England Interstate Water Pollution Control Commission (NEIWPCC) was funded by USEPA Region 2 to manage a contract with Rutgers University and the US Geological Survey (USGS) to conduct a research project involving nutrients and ecosystem health in Barnegat Bay-Little Egg Harbor (BB-LEH). Objectives include modeling nutrient loading, determining estuarine biotic responses, delineation of the current biotic and seagrass habitat conditions, and development of a biotic index of estuarine condition using water quality and biotic indicators to assess eutrophication, impairment, and overall ecosystem health of the BB-LEH estuary. 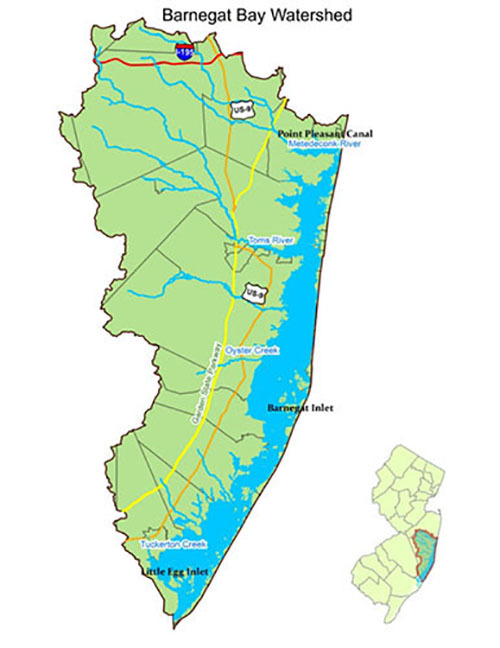 This research is intended to support the DEP's efforts on nutrient and water quality management for the BB-LEH estuary.